At the start of each class, veterans are assigned to work together in small teams of 4 to 6 people. One of the Black Diamond Charities instructors serves as their dedicated Team Coach. Together, teams identify a project for which to develop a project management plan. They collaborate during class time, and normally have a team call during the week to finish assignments on the topics they learn each Saturday. Each team developed, presented and submitted the following project deliverables: Charter, Stakeholder Register, RACI chart, Requirements document, Scope Statement, Work Breakdown Structure (WBS), project schedule, risk analysis, project budget and final presentation of their respective projects. Team Members (from left to right): Bill Baxter (team coach), Rachel Burke, Ontario Robinson, Roger Machut, Kevin Meeker. Team Aegis’ project is to design and oversee construction of a new park in a suburb of Chicago to meet demand resulting from new housing. The site plan makes good use of land adjacent to a river with an awkward shape that makes it had to use for other purposes. Team Members (from left to right): Albert Alexander, Renee Rouse, Ira M. Hendon, MBA, PMP, CSM, CSSC (team coach), Denise Mathus, Angela Tyler, Jason Glanz. The VetRAC team proposed a transitional residence and training center for Disabled and non-disabled veterans to develop skills in multiple technologies that provides veterans access to higher paying career opportunities. Each training curriculum is targeted to be 15 weeks in duration. The initial set of technologies identified are R (Robotics), A (Artificial Intelligence) and C (Cybersecurity). The veteran students will be hired apprentice (employees) with the corporate sponsor organizations. The transitional residence and training classrooms will be American Disability Act (ADA) compliant to accommodate our disabled veterans. The veteran students will also have access to life services including transportation to the VA for medical and/or mental health services, transportation to their employer during their apprentice program and meal services while at the center. Screening and background checks will be part of the student admissions process. Students will not be charged tuition. In fact, the veteran students will be paid an hourly rate during their training. Initial rollout included: training center/residence hall acquisition, buildout, setup the technology labs, life services coordination, hire staff, identify the instructors, admit the veteran students, setup the apprenticeship with the corporate sponsors and launch the first class. The initial pilot class is expected to have 20 Veteran students and will focus on Robotics. Team Members (from left to right): Chris McClintock, Nestor Zavala, Eric Villareal, Deb Kirschenmann-Driscoll (team coach), Michael Fulton, Chad Holder, Darrell Berg. The team chose a project to set-up an ongoing training program. Building Blocks will address the gap in skills training at the youth and workforce level by assisting in community-based projects. We will provide training in trades for youth through partnerships with construction companies and unions. Each cohort will learn entry level responsibilities needed to enhance their opportunity to gain employment in the trades by completing work that improves the Chicagoland area. Upon completion of a cohort youth will have the opportunity to continue to build their skill level through certified programs provided by union apprenticeship programs. Through collaboration with businesses, local leaders, volunteers and the Building Blocks team we will strive to achieve four cohorts a year. The quarterly project will span through different communities in Chicago who are looking to enhance opportunities for their youth and transform high risk areas. Through collaboration with businesses, local leaders, volunteers and the Building Blocks team we will strive to achieve four cohorts a year. Determine all the value added proposition of the State of Illinois and the city of Chicago, from the perspective of various resource types: e.g., institutions of higher learning and thus a highly skilled workforce, rail/road/air travel and thus being a transportation hub of the Midwest, affordable housing and cost of living, cultural resources in the city, diversity of population and how that translates to diversity in the workforce, among others. The team provided a Scope statement, Business Case, Timeline, SWOT and Risk Analysis, Cost Estimate, towards a final deliverable to the city and state on how, when, and what to pitch to Amazon bring HQ2 to the city of Chicago, state of Illinois. The purpose of our project is to give Veterans in our city a safe place to sleep. We want to address the needs of the homeless community with a comprehensive, focused approach; providing not only shelter, but programming and services to help reintegrate the homeless population back to society with all the tools they need to be successful and sustain themselves for the future. Why? The answer is simple- everyone deserves a roof over their head, clothes on their back, and food on the table. We will provide short-term housing in small units and support services to homeless community members. The clients will be directly sent to us through one of the community partners that provides homeless resources and programming currently. The programming will be provided by community partners that encompass employment, education, and social community building with a peer support network. The project will be under the Tiny Homes, Big Hearts (501c3) that has already been established. Team Members (from left): Sponsor Ira M. Hendon, MBA, PMP, CSM, CSSC; Site Plan Lead Brian McGehee; Quality and Risk Plan Lead Ezinwa Nwankpa; Budget and Schedule Lead Mike Willis; Facility Plan Lead William “Tripp” Butusov; Team PM Dan Perez, Services. The Veterans Village team proposed a Center that provides life support services to proactively re-integrate homeless and re-patriated Veterans into society as productive citizens. The Village would provide the Veterans meals and housing; transportation to Job Training facilities; transportation to the local VA facility for health and mental care; assist with enrolling the Veterans for eligible social services care. The Veteran’s Village team identified value for the following groups of stakeholders: Resident Veterans, Politicians, Veteran’s Village Manager, VA Medical Personnel, Village Caseworker and Veteran Social Services Providers, Job Training Centers and Job Providers, and the community where the Village is located. The team prepared a budget for the Pilot launch of $5,000,000 and an initial estimate for the first six months of operations. The estimated schedule was 120 days to launch the Pilot. The Pilot would initially accommodate 10 Veterans. This project team also presented their final presentation at the March 2018 PMI Chicagoland Chapter Dinner meeting. 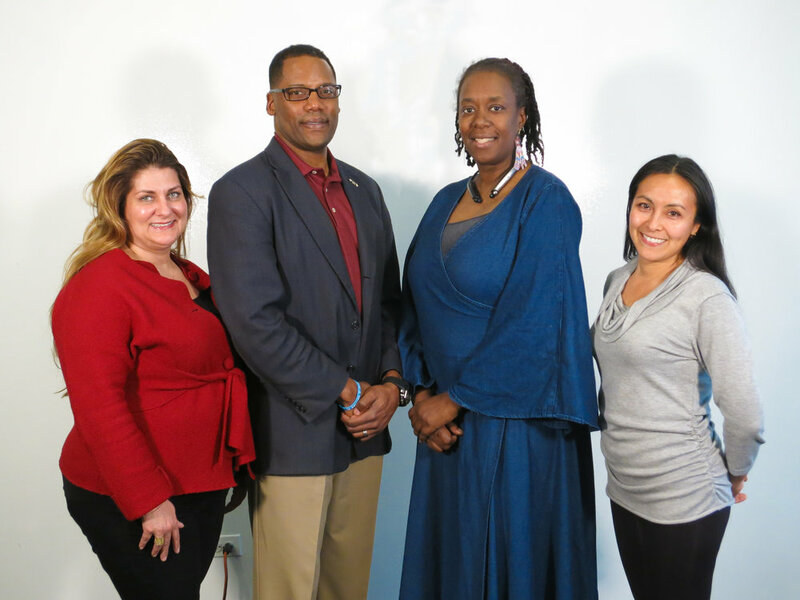 Team Members (from left to right): Diana Morgan, Rodney Williams, Heather Smith, Sponsor Antuanete Sanchez, PMP, LSSGB, CSM, and Marlena Ragland (not photographed). Project Stand Up provides life essential services to Chicago area homeless and at-risk Veterans while attending local area Stand Down events. This organization intends to fulfill an existing need within this target demographic. Stand Up provides access to life services to at risk veterans: such as bathrooms, showers, clean clothes and personal grooming while attending VA Stand Down event. Team members (from left): Sponsor Elizabeth Gain, MBA, PMP, Lean Six Sigma Black Belt Terri Gianotti, Jessica Wallace, Gerald Bolden and Kenny Henry. As a National Leader in education, the Illinois State Board of Education mandated a Social and Emotional Learning (SEL) curriculum for grades K-12. Implementation of the K-12 SEL curriculum places Illinois among an elite 6 states with SEL development expanded standards to include both elementary and high school students. The five competencies of SEL are: self-awareness, self-management, social awareness, relationship skills, and responsible decision making. A market analysis determined the majority of Illinois high schools have not met the SEL mandate. The Illinois State Board of Education wants to rollout the curriculum for grades 9-12 and implement a tracking tool to monitor implementation of SEL for the over 1,300 Illinois high schools. To prepare for the pilot, the team identified an evidenced based Social and Emotional Learning (SEL) curriculum that complied with the state mandate. The team collaborated with a Research Institute to select the 4 pilot high schools and to conduct the pilot. The pilot high schools represent urban, suburban, rural, mid-state, and downstate communities. The pilot schedule for the 2018-2019 school year addresses the curriculum manager integrating the curriculum into the existing Health & Wellness Modules, training teachers, teaching students as part of 10-50 minute modules, assessing the curriculum, and presenting the assessment to the Illinois State Board of Education. The curriculum costs and training are covered under Title 2 Federal Funds. The pilot will provide best practices for curriculum rollout across the state and develop the implementation tracking system. The $700,000 project budget includes a 20% contingency for risks associated with different types of schools, as well as developing the tracking tool to monitor compliance with the mandate. Team members (from left): Sponsor Gayle Silverman, PMP, Jeremy Mackey, Maurice Coleman, Khariell Pinkney, Jon Gabrielson, Priscilla Compton, Sponsor Nora Ten Broeck, PMP. Team Tropic Thunder proposed the use of Hydro Turbines to generate energy for the grid. Turbine projects would provide a low environmental impact, sustainable source of supplemental power generation associated with geographies meeting the water flow requirements. The team identified the following categories of stakeholders: Technical, Regulatory and Public. Within the technical category are: Turbine manufacturers, material providers, engineering design and contractors. Within the regulatory category are: Army Corps of Engineers and the City/State. Within the public category are: Neighboring businesses, environmentalists and energy producers. The anticipated budget for a standard turbine project is $295,000.00 with the opportunity to lease a turbine for a $120,000.00 annual return on investment. The budget includes the turbine cost, warranty, construction, associated permitting and the infrastructure to bring the water to the turbine and the connection to the grid. Team Members (from left): Don Kramer, Natasha Ashford, Quentin Smith, sponsor Ira Hendon MBA, PMP®, CSM®, Nekohl Mace, Dave Ullrich. The Storm Ducks team identified value for the following groups of stakeholders: Railroads, Private Investors, Emergency Response Agencies, Evacuees, Federal, State and Local government agencies, Vehicle Operators, Educators and Media. The team prepared two budgets (Pilot and National Rollout). The Pilot budget (Year 0) estimate was $5.0 Million USD. The National Rollout budget (Years 1 – 3) estimate was $9.0 Million USD. The combined total budget estimate was $14.0 Million USD. The program had two rollout plans (Pilot and National Rollout). The pilot would consist of six DUCKS located in the continental U.S. SE geography and would support the Atlantic coastal areas. Upon a successful pilot, expansion to a National Rollout that would support the Gulf states and other regions of the country. This project team also presented their final presentation at the November 2017 PMI Chicagoland Chapter Dinner meeting. Each location would be ADA accessible and compliant with local food handling regulations, and the necessary permits would be secured from council members in advance. As part of the risk management plan, security would be provided through the use of police officers. After-hours cleanup and trash disposal was also provided as part of the project considerations. As part of this pilot, Team Business developed a risk assessment plan, a budget that included both volunteer and paid positions, the minimum need for food donations, as well as alternative meal options that would vary depending on the amount and types of donations. QR CODES (QRC) consulting firm was engaged by a dual-mission community outreach program located in Chicago, IL to create a marketing campaign and operations plan for implementing their rehabilitation residential housing program to provide displaced homeless veterans the tools they'll need to establish long-term housing and job placement after completing outreach program. This engagement was to be completed within 9 months for a budget of $650,000. Establish an ongoing resident referral program through five (5) existing Veterans outreach programs (Ex: Wounded Warriors, Volunteers of America, Safe Haven, VA Medical). Screen, approve residents for participation. Identifying and Selecting small business options which will best serve for community residents job skill training needs and future job placement potential while also adding to community service needs and economic development. Lease executed and moved in. Create commercial occupancy incentive package (residential) Select six (6) Veteran owned small business to occupy the community’s six empty commercial real estate rental spaces and training requirements. Determine financial needs towards staff support resources, secure funding and Small Business incentive programs. Create a master training template to ensure each business can provide the residents on site a defined structure and scheduled On-the- job training opportunities. Provide residents fully trained in job functions and job placement skills.